Do you perform local apartment moves? We are the best local apartment movers because we treat your move like it was our own. We have performed thousands of apartment moves in Philadelphia, Washington DC, Alexandria, VA and beyond. We are the best apartment movers because we have seen it all. There are plenty of things to consider when moving to or from an apartment. When you are moving out of or into an apartment, you will want to inform both locations of your desired moving date at least 1 full month in advance. If you are moving in the summer, we recommend getting in contact with your front desk for elevator reservations and parking reservations as far as two months in advance. Then speak with your local moving company on when they feel you will need to have your elevator reserved time wise. Each building has different rules and regulations for apartment elevator restrictions. Some do not allow moves on weekends or during peak rush hour times as their tenants need them. Many people think that apartment moves will be very quick because they live in a studio or a 1 bedroom apartment and the moving company can finish in no time. This is not always the case. There are a few things that can factor into making a small move with just a few items still a long move. Small Elevators. Most people think elevators make a move go quickly. It often adds quite a bit time to a move because you can only fit so much in at a time and often need someone on both sides to send / recieve the furniture items. Long Walks. If your apartment is far from the elevator or there is a long walk from the elevator to where we can park the truck, the move could take much longer than expected. Parking Conditions: If you live in an apartment with a loading dock, we often can use 4 wheel dollies to expedite the move and keep the movers fresh. If we have to park on a busy street, or even worse, across a busy street, expect the move to take longer than expected. If you live on a cobble stone street or a street that can not handle 4 wheel dollies, then the move will take longer than expected as we must carry everything, often in pairs. In some major cities, you must have 1 person remain with the truck outside at all times to avoid a fine. This means we have to have at least a three man crew, which means the hourly rate or flat fee must account for this person. Also please keep in mind that you may need to register for a parking permit. If we receive a parking ticket, we likely will pass this on to the customer as part of the bill. I do not have a lot of stuff, so how long will my move take? How much will my apartment move cost? This is always a tough question to answer as there are a lot of variables that factor into a local apartment move that we already went through. We typically provide our clients an hourly low and and an hourly high end estimate based on the information you provide. Because conditions can vary from apartment to apartment, we always stress that it could take as long as an additional hour or even two hours. On average, a 1 bedroom apartment move can be as little as $300. Your specific details can add as much as $500 to $600 to that. Travel to your next apartment, preparedness, your inventory of items to be moved, elevator reservations all play an important role in cost. What can I do to prepare for my apartment move? How can I save money on my apartment move? We recommend packing everything up in advance and using uniform sturdy boxes from a place like uhaul or home depot. Using small boxes from the grocery store or wine and spirits store will not be helpful to your move. The more uniform the boxes are, the more we can move at one time and the cleaner we can stack them on the truck. We recommend not using plastic bags for packing as they are harder to stack neatly on the truck. If you have the ability to take smaller, more fragile items over to your new apartment or home in advance, that will save on time. Miscellaneous items are always more challenging to move and fragile items take the longest to prepare for shipment on a truck. If you take some of these items over in your car, you likely will save some money and time on moving day! If we come to your apartment on moving day and everything is boxed up neatly, we can operate at peak efficiency. If we come to your apt on moving day and there is still packing to do and a lot of loose items to manage, we may take longer than estimated. Elevator reservations are very important for apt moves! We recommend checking in a couple of times with your management group and local moving company to ensure everyone is on the same page. Please keep in mind, some people or companies will try to hijack the elevator and that may be beyond everyone’s control. If this happens, we are stuck and unfortunately have to make the best of the scenario. If the elevator is very small, we may try to use the stairs to expedite the move, but that only is helpful if you live one flight or two flights from the ground. Anything higher than that will become too challenging for the crew. 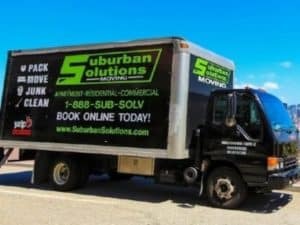 At Suburban Solutions, we can help you many ways to make your local or long distance apartment move as quick, affordable and stress free as possible. The better prepared you are and the better the conditions we have, the more money you will save on your apartment move! We pride ourselves on communication, so please keep us up to date on your status and we can always plan accordingly. We look forward to helping you on your apartment move, whether its cross country or cross town, we are your #1 apartment movers!